Located in the heart of Fiuggi, this spa hotel is within a 5-minute walk of Piazza Spada and Fiuggi L'Acqua di Bonifacio VIII. Terme di Fiuggi and Fiuggi Golf Club are also within 1 mi (2 km). 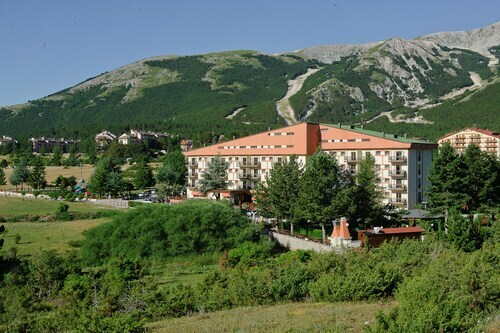 Located near the slopes, this Rocca di Mezzo hotel is in the mountains, 0.1 mi (0.1 km) from Sirente-Velino Regional Park and close to winter activities such as cross-country skiing and skiing lessons. Chamois Visitor Center and Wildlife Area is 1.6 mi (2.7 km) away. 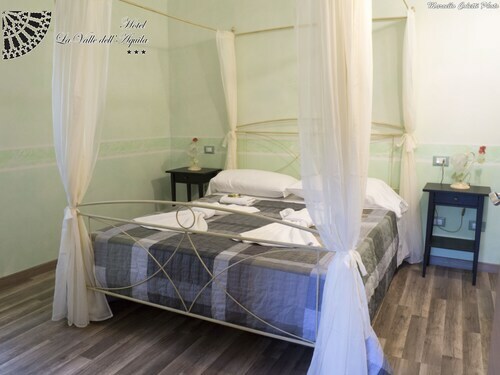 Located near the slopes, this L'Aquila hotel is in the city center and within 1 mi (2 km) of Tommaso Fattori Stadium, Forte Spagnolo, and Museo Nazionale d'Abruzzo. Church of San Bernardino da Siena and L'Aquila Public Pool are also within 15 minutes. 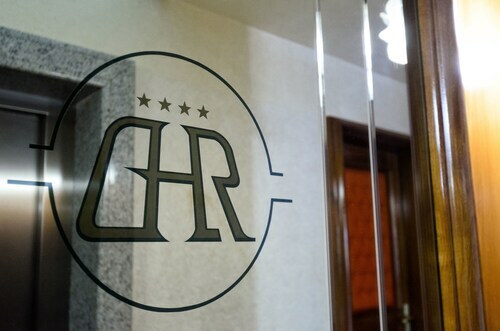 Situated in Ovindoli, this hotel is 0.1 mi (0.1 km) from Sirente-Velino Regional Park and 2.4 mi (3.8 km) from Chamois Visitor Center and Wildlife Area. Church of Santa Maria Valle Verde and Museum of Sacred Art of the Marsica are also within 9 mi (15 km). How Much is a Hotel Room in Tagliacozzo? Hotels in Tagliacozzo start at $52 per night. Prices and availability subject to change. Additional terms may apply. Looking for hotels in Abruzzo, especially close to the Tagliacozzo area? The center of Tagliacozzo offers 2 suitable hotels and apartments within 6 miles (10 kilometers). Located within a manageable distance of Tagliacozzo, are the Hotel Trattoria di Sante Marie and Villa Palentina Country House. 19 miles (30 kilometers) outside of the town center of Tagliacozzo, you will find the Grand Hotel Palazzo Della Fonte. The Robur Marsorum is approximately 15 miles (25 kilometers) away. More hotel options worth checking out are the Best Western Hotel Fiuggi Terme Resort & Spa and the Park Hotel. 55 miles (90 kilometers) away from Tagliacozzo, you can reach Pescara, which is where you can spend the day enjoying Provincial Nature Reserve Pineta Dannunziana and Piazza della Rinascita. Some of our recommended Pescara places to stay include the Villa Maria Hotel & Spa and Gardenia Hotel. 45 miles (72 kilometers) east of Tagliacozzo, you may also choose to stay at Serramonacesca, which boasts the Villa Pardi and B&B Le Pietre Ricce. Should you choose to stay in Serramonacesca, a couple of places to add to your itinerary are the Hermitage of S. Onofrio Serramonacesca and San Liberatore a Maiella. Before you head home, why not spend an afternoon enjoying the plays with some of Abruzzo's spectators at a community game. You'll find Olympic Stadium 40 miles (68 kilometers) to the west of Tagliacozzo. Find accommodation not far from the action at the Rocco Forte Hotel De Russie or the Kaire Hotel. Located 40 miles (62 kilometers) outside Tagliacozzo's downtown area is Ciampino Airport. 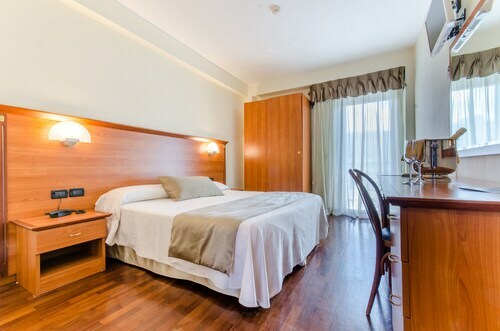 Find accommodation nearby at Quintili or Appia Park Hotel. A beautiful hotel located in a gorgeous area. New, clean rooms with an outstanding staff. The views from the grounds are simply amazing. A great place to stay! We stay in this hotel for a couple of days, everything was wonderful and love having breakfast there. we were 10 people staying there, I do recomended theis hotel either If you travel with family or not.